Courtesy photo The Little Buckeye Children’s Museum has launched a new program, Museums for All, sponsored by Richland Bank. 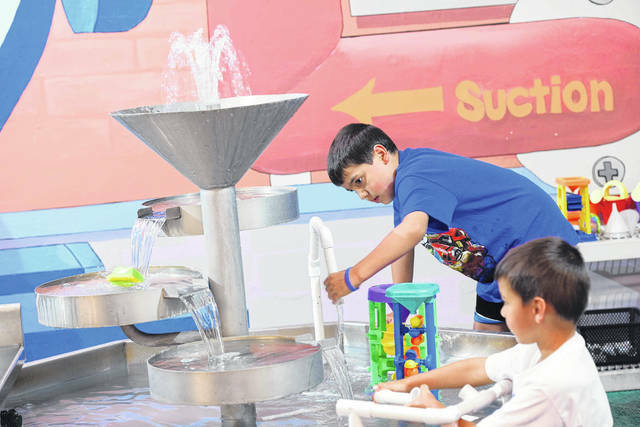 MANSFIELD —The Little Buckeye Children’s Museum has launched a new program, Museums for All. The program is sponsored by Richland Bank. Museums for All is a cooperative initiative with the National Association of Children’s Museums (ACM) to offer a signature access program that encourages families of all backgrounds to visit museums. This program is designed to reach out to the economically disadvantaged families across the country, and it allows them the opportunity to come and enjoy the benefits that museums have to offer at a significantly reduced admission price. Thanks to Richland Bank, the Museums for All program allows Little Buckeye to offer individual admission fees of $1 to families presenting an Electronic Benefits Transfer (EBT) card for up to four individuals, making the museum more accessible than ever. By removing the financial barrier, Museums for All also removes the social and academic barrier children face when they are not exposed to high quality cultural experiences like attending museums. In addition to helping those in need, Museums for All offers reduced price admission to active-duty military personnel and veterans, and all guests in wheelchairs will receive free admission. Little Buckeye Children’s Museum is proud to partner with Richland Bank, whose culture is deeply rooted in the values of service and philanthropy, to bring this incredible program to the museum for our beloved guests. https://www.thebellvillestar.com/wp-content/uploads/sites/39/2018/09/web1_buckeyechildrens_27.jpgCourtesy photo The Little Buckeye Children’s Museum has launched a new program, Museums for All, sponsored by Richland Bank.